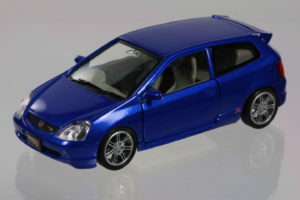 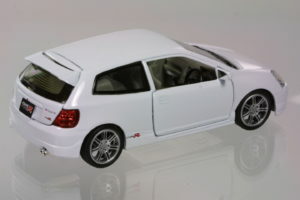 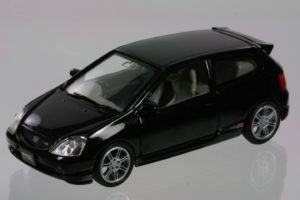 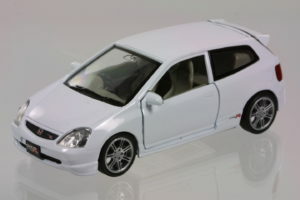 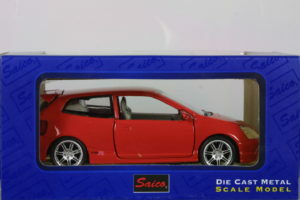 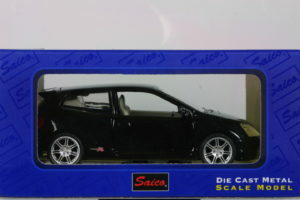 Saico’s model of the 2001 Honda Civic EP3 Type R has good exterior and interior detail considering it’s a pull back toy. 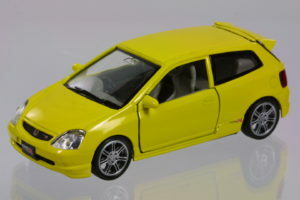 The car comes in black, yellow, red, silver, blue and white. 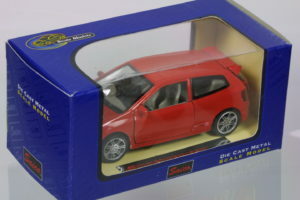 In some markets, this model is available individually boxed in a windowed blue box complete with base. 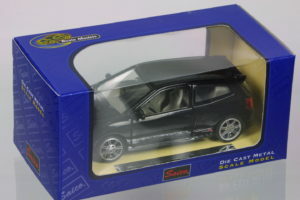 Otherwise, it comes on a tray of 12 cars and sold in bulk. 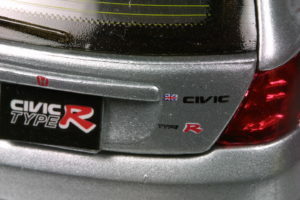 The exterior of the car include some fine details such as finely printed badges – on the rear hatch: “H” logo, the UK flag next to the “Civic” badge, and the “Type R” badge; on the side: “Type R” behind the front door; and on the front grille: “H” logo and “Type R”. 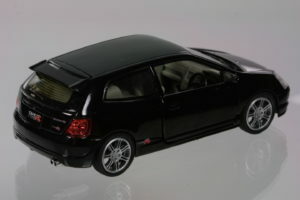 The windows (front, rear and rear side) have black borders including even the fine dots that transition from the black border to the clear window. 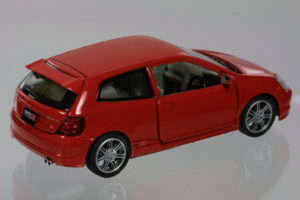 The rear window has defroster lines molded into the window. 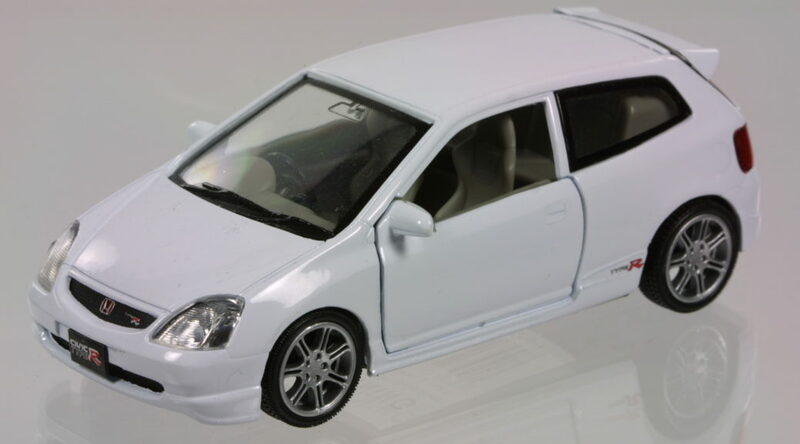 The front windshield has wipers and a rear mirror molded in it as well. 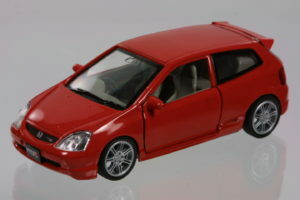 Operating parts include opening doors and hatch. 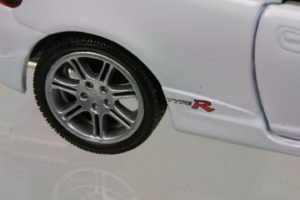 The wheels are very good replicas of the 14-spoke Civic Type R wheel. 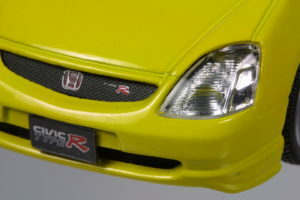 The headlight and taillight reflectors beneath the outer lenses are quite accurately molded as well. 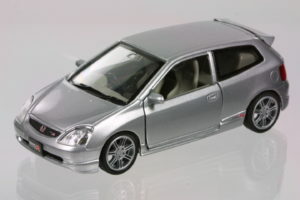 The grey interior is RHD like the UKDM Civic with accurately modeled dash, shifter, steering and front seats (Recaro). 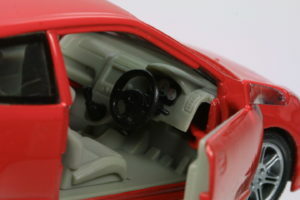 The rear seats are a tad high (to accommodate the pull back motor) and there is a partition between the passenger compartment and trunk which should not be there. 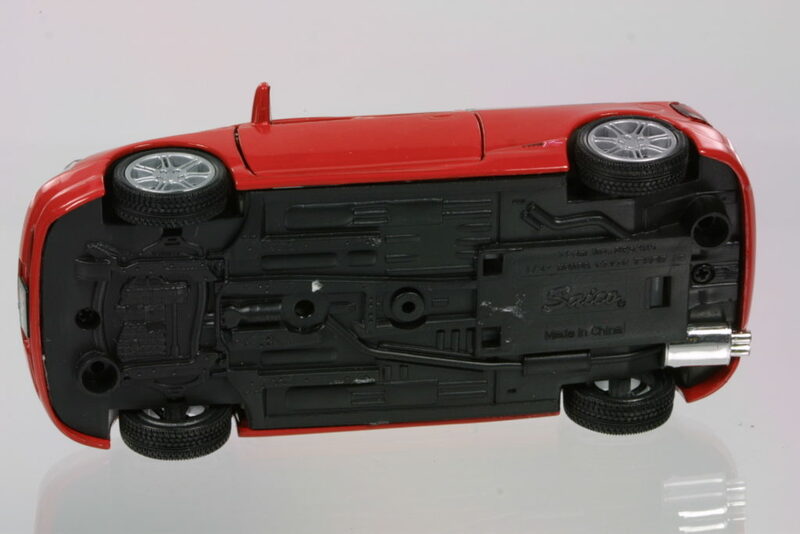 The undercarriage has some semblance of suspension and engine sump detail but not accurately representing that of the real car. 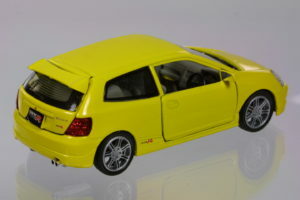 Markings on the bottom include: “DP5205”, “Made in China” and “1/32 Honda Civic Type R”. 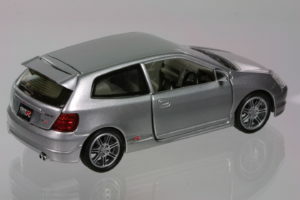 An interesting undercarriage detail is the separate chromed exhaust muffler and tip.